After loading data into a database, issues may appear in which case the data and the data package should be removed from the database. Removing a complete data package is called a Rollback. Each data import session is automatically assigned an EBATCH number. The Rollback feature in EDP allows the removal of data by determining the EBATCH associated with the bad data, and then removing each record from all of the tables related to that EBATCH. •The Rollback will not be successful if the referential integrity of the data is broken as a result of the rollback. For example, if a reference value was added using EDP with other data — and it is determined that this other data is faulty — it is only possible to remove that data if no other data in the database uses the reference values associated with the reference values in the same EBATCH. System.Data.SyntaxErrorException: Syntax error in the expression. 1.Click Data Tables in EQuIS Professional located in the Open group on the Home tab. 2.Select the data table with data you would like to roll back (e.g, select DT_SAMPLE). 3.Within this data table, scroll to the right until EBATCH is the right-most column. 4.Click the EBATCH column header twice to sort the column in descending order (so that the small arrow in the header points down). 5.Make a note of the EBATCH you would like to roll back. 6.Open EDP by clicking the icon located in the Import group of the Home tab. 7.Click Rollback (located in the Package group on the Professional tab). The EQuIS Import Rollback window contains the same information as ST_EDD_BATCH so that you can identify the exact EBATCH to be removed. 8.Highlight the EBATCH record to roll back. 10.To confirm, click the record to roll back and then click Rollback >. Once the process is completed, it is possible to confirm the Rollback process was successful and that the data was completely removed from the database. 2.In EQuIS Professional, click Data Tables . 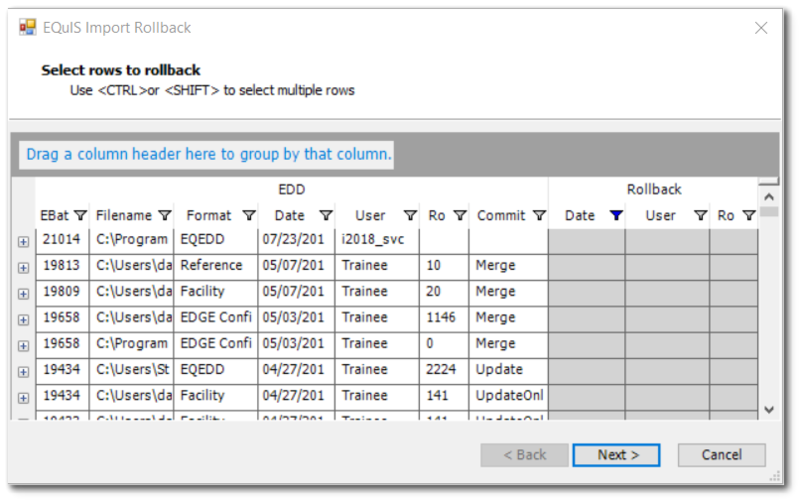 3.Open the data table that the Rollback was performed on (e.g., DT_SAMPLE) and double-click the EBATCH column. The EBATCH selected to roll back should no longer be listed in any table in EQuIS 6 Professional.